Another round of Kevin James falling down will be available on Blu-ray in October. 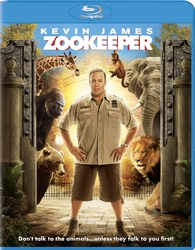 In an early announcement to retailers, Sony has slated the comedy 'Zookeeper' co-starring Rosario Dawson and the voices of Nick Nolte, Sylvester Stallone, and Adam Sandler for a single Blu-ray edition as well as a Blu-ray/DVD/Digital Copy Combo Pack on October 11. The Blu-ray will feature 1080p video, a DTS-HD Master Audio 5.1 soundtrack, and loads of featurettes including: Laughing is Contagious, Bernie The Gorilla, The Cast of Zookeeper, Creating the visual effects, Animal Meeting, Riding An Ostrich, Behind the Stunts, The Furry Co-Stars, and Be The Bear. Suggested list price for the Blu-ray is $35.99, while the combo pack is $45.99. You can find the latest specs for 'Zookeeper' linked from our Blu-ray Release Schedule, where it is indexed under October 11.